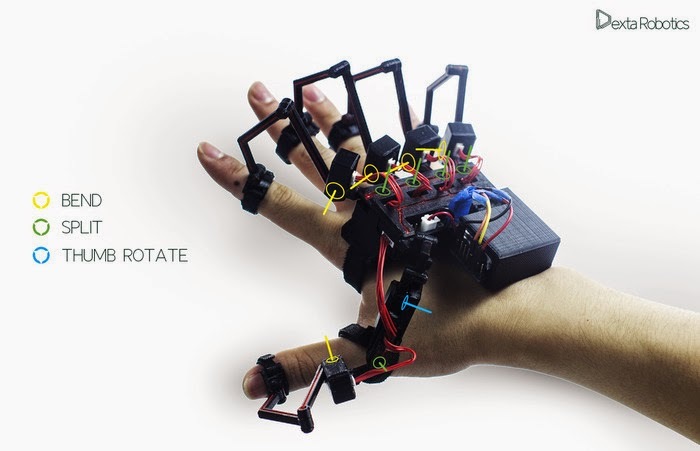 Tech Center: Dexmo transfers your hand movements to the digital world. Dexmo transfers your hand movements to the digital world. Kickstarter over the years has harbored and successfully brought more ideas into the commercial industry unlike anything else. The Virtual reality head mounted display Oculus Rift is a good example that proves the point. Oculas Rift started of as a $2.4 million project on kickstarter in 2012 and now its a company worth $2 Billion. But we are not talking about Kickstarter or Oculas Rift here, we are talking about another revolutionary idea in the Virtual reality scene, called the 'Dexmo'. Dexmo is a hand wearable exoskeleton that input your hand movements into the digital world and outputs force feed back to your finger so you feel the object in the digital world. Dexmo is a project developed by Dexta Robotics, a robotics start-up based in Shenzhen, China. Well the technology is not something very new. We have had countless university and academic projects that are quite similar to this. However what sets this itself apart is the fact that its going to be affordable to buy and cheaper to build. Its designed for mass production, its not just a prototype its developed on principle of DFM (Designed-for-manufacturing). The product will be devoloped in 2 variant, the Dexmo Classic and Dexmo F2. 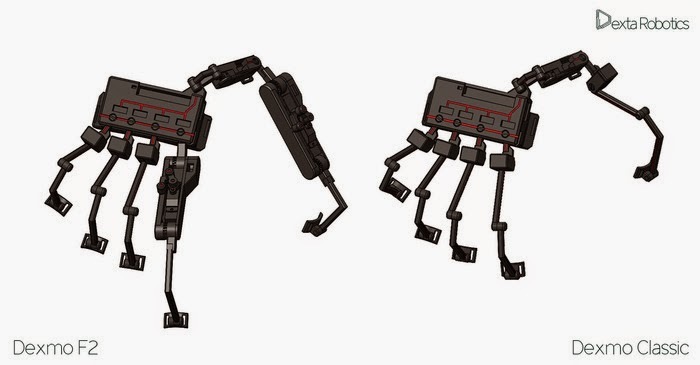 The Dexmo Classic is a wearable mechanical exoskeleton that captures 11 Degrees of your hand motion. This includes the rotation of the thumb, the bending of the individual fingers, and the degree to which they split apart from one another. It also uses a single IMU (inertial measurement unit) to track the hand's movement through space on X, Y and Z axes. This is expected to be a relatively inexpensive product. The second variant the Dexmo F2 is comparitively more advanced. It provide you with digital force feedback (on/off only) for your index finger and thumb that allows you to feel a digital object on top of hand motion capturing. It achieves feedback by braking the joint using a patent pending technology: a miniaturized joint gear-disk braking mechanism. When a collision is detected(either by the collision detector in a program or by a pressure sensor in real life), a signal is sent back to the device, then the actuators activate and brake the joint, the exoskeleton locks, preventing the finger from further bending inwards, thus creating a normal force on the user’s fingertip this is achieved by using micro servo motors. All this is achieved with no compromise to your regular hand motion. Well the application are endless. From Gaming to Virtual Reality to Robotics. This could be used by Gamer, Doctors, Astronauts and Roboticists alike. So far they have raised about $33,000. They want a funding of $200,000.